NOTE: THE TYPE OF RATINGS THAT I AM TALKING ABOUT ARE FROM ONE STAR TO FIVE STARS AND EVERYTHING IN BETWEEN. THIS IS ABOUT THE FACT THAT THERE IS A RATING, NOT WHAT STAR IT IS. I WILL FEEL THE SAME ON THIS TOPIC FOR A ONE STAR AS I WILL FOR A FIVE STAR. 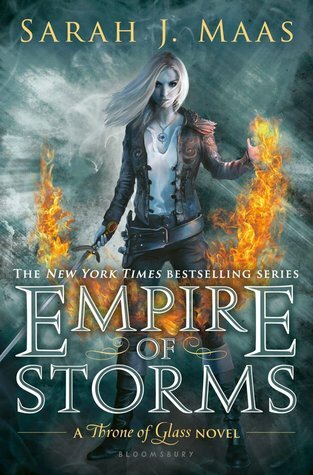 Okay, so if you don’t know, there’s been a debate on Empire of Storms on Goodreads. This debate is actually surrounding the issue of pre-release ratings. Some people are saying that they don’t like them and other reviewers have decided to post their opinion on it. I decided to post my opinion and two cents. Feel free to discuss with me in the comments below (since that’s what we’re all here to do)! First of all: yes. I like the Throne of Glass series. Am I aware that it his issues with under-representing and seems to have characters go through ridiculous situations that have pushed away numerous readers? Yes, I am aware. I listen, I like some of those negative Throne of Glass reviews, and then I move on. Here’s a questions that I’m chosing to answer. Do I have an issue with pre-release ratings IF AND ONLY IF they have NOTHING to do with any of the content the reader has read? Yes. Yes I do. This is what I DO have a problem with: ratings based on someone’s dislike for a previous book written by the author. In the case of Throne of Glass, I’m talking about ratings for Empire of Storms (one star, five stars, and all those stars in between) based on The Assassin’s Blade, Throne of Glass, Crown of Midnight, Heir of Fire, and Queen of Shadows. Do you see Empire of Storms in that list above I gave you or in any “read”, “dnf”, or “sample”, or “read-and-loved” shelves in any phrase or context? What is your rating for this individual book based on then? The last three books? What does that have to do with this one? And, like I said. I have a problem with these kinds of ratings. If you’re someone who does this, then you’re not breaking any law. It won’t ruin my day, but I might roll my eyes and scroll on. I DON’T have a problem with pre-release reviews. I’m talking about the reviews for Empire of Storms that are shelved as “will-never-read” and “poison-to-my-soul” and “not-until-i-am-in-my-deathbed” and “i-love-this-author”and “dorian-is-my-bae” and “best-series-ever” and have a review but NO RATING. I AM FINE WITH THAT. A review will explain to me WHY you have shelved this book as something you will never read or as something you will buy on the first day and allows you to approach your topic of criticism for the series and the previous books that have impacted you not to read or to definitely read the next one. I don’t mind those at all. In fact, I’ve even liked some of them (for Empire of Storms nonetheless). I just stated why I am one of those people who have a problem with rating a book that you haven’t even seen one page of. I don’t mind anything else, actually. That is my two cents on this topic. What are your guys’ thoughts?